The Boston/New England Chapter of the National Academy of Television Arts & Sciences Announces New Chapter President. BOSTON, MA –Wednesday, September 12, 2018: The Boston/New England Chapter of the National Academy of Television Arts and Sciences (NATAS) announces Danielle Mannion as the elected 2018-2020 chapter President. Mannion was elected unanimously by the Board of Governors on May 15, 2018. Her 1st two-year term began on July 1, 2018. Out-going President, Ro Dooley Webster passed the gavel to Danielle at the 41st Boston/New England Emmy® Awards Ceremony last June. Danielle has been a NATAS member serving on the Board of Governors since 2008. During her time, she has served as Secretary, National Trustee and Student Awards Chair. 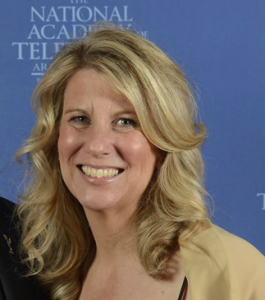 She currently serves as the National Education Chair for the National Academy of Television Arts & Sciences creating and Co-Executive Producing the “National Student Production Awards” which is hosted by longtime NATAS supporter and friend, Tom Bergeron. As a 20-year television and film teacher at Millis High School, Danielle used her passion to guide her students within the media and production industry. She created the annual “Lights, Camera, Action: Television and Film Conference” at Millis High School. LCA connects thousands of High School students with industry professionals in free workshops and panel discussions. Danielle and her students are the proud recipients of awards including a Telly Award, and many NATAS regional Student Production Awards. Danielle also works in the independent film industry as an Art Director and holds an undergraduate degree in Communications from Syracuse University; Newhouse School of Communications. She holds a Master’s Degree in Applied Communications from Fitchburg State University. For a complete list of the Boston/New England Chapter of the National Academy of Television Arts and Sciences Board of Governors and elected officer list, click here.